We’ve been quietly shopping for a sail boat for months. 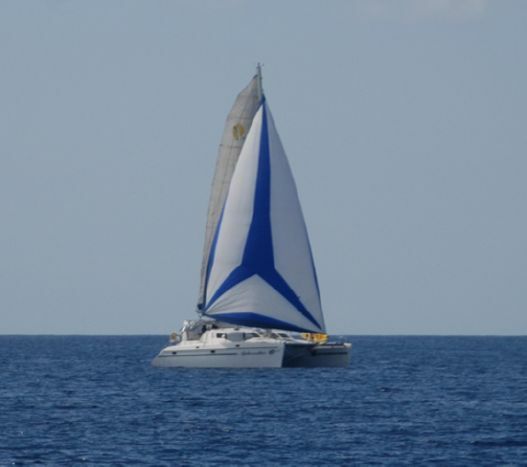 But, this week brought some closure and excitement when our offer to purchase a St Francis 50 catamaran was accepted. We take possession of the boat on March 31st. We wanted a boat that was sea-worthy, suitable for ocean passages, and would be able to accommodate our family of six. To assist us with our decision-making, we had the advice of an experienced broker in Bradenton, Florida. We considered buying an Antares 44 in New Zealand – but that involved an Atlantic crossing to bring it to the United States or Canada. Our St Francis 50 is located in Fort Lauderdale, Florida. We can’t drive to Florida from Ottawa in an afternoon, but moving the boat from one marina to another isn’t a major undertaking. We bought Aphrodite, which is the flagship St Francis 50, and the focus of Neil Rusch’s “St Francis 50 Review” (Multihulls Magazine, May/June 2005). Buying a boat has put some of our goals into sharp focus. Our first step is to arrange boat insurance and arrange for some refits, and then we need to pack up our house, streamline our affairs, and continue with sailing training. We plan to live aboard in July or August 2015. It should be said that we didn’t buy this boat to test our abilities. We are not cowboys of the sea. My husband plans to attain the RYA Yachtmaster designation, and when we step aboard for the first time, we plan to sail with someone with experience. We’re going to be busy. It’s only only four or five months before we depart. Congratulations! Mary will be so jealous that you got a cat.